I can almost taste the caviar-flavored popsicles. Ah, summer. Sitting on porches. Sweet tea. Hiking. Pulling off million dollar heists in the sweltering Mississipi heat. Walks around the park. 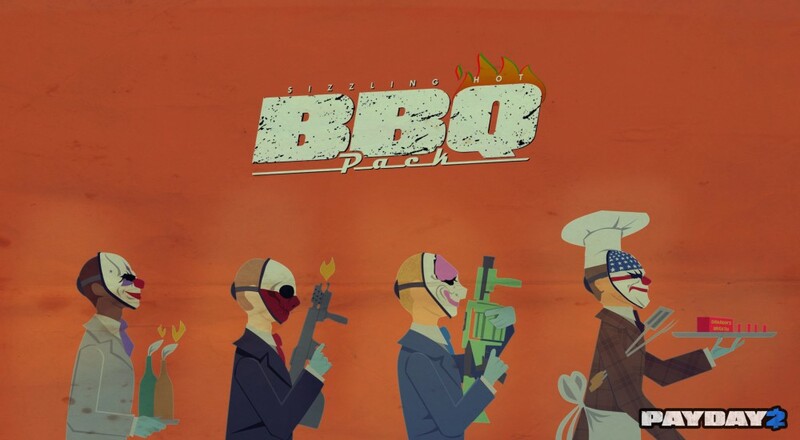 Payday 2 "Butcher's BBQ Pack" DLC. Golfing. Picnics off of small-town dirt roads. Watching your nephew's little league games and throwing a corn dog at the umpire. Walking your dog around the neighborhood. Ice cream. Filling up a hot tub with twenty dollar bills and pretending to drown in your own wealth. Like the great Lizard uprising of 2018, many of those things are soon to be upon us, but at least one of them already is. That's right, Payday 2 has a new DLC pack out now called the "Butcher's BBQ Pack", which adds a few new fiery options for those of you who need to roast an entire building before you can satisfy your burglary cravings. To top it all off, you can pick it up right now for $4.99 on Steam! You may not be able to kick summer off by paying a man to go stand in a Braves game and yell "I'm caught in a pigeon love triangle!" until he's escorted out of the stadium just yet, but hopefully this DLC can give you a little taste til then.